The deal size is for 125mil shares at a price range of 23c to 28c per share. This would place its total raised to anywhere in the range of $28.75mil to $35.0mil. There will be a total of 462,392,475 shares post-invitation with an approximate free float of 27% post-listing. The cornerstone investors will take 59,265,500 shares while the placement tranche has a total of 61,984,500 shares. This leaves the public with only 3.75mil shares with hardly even $1.0mil. 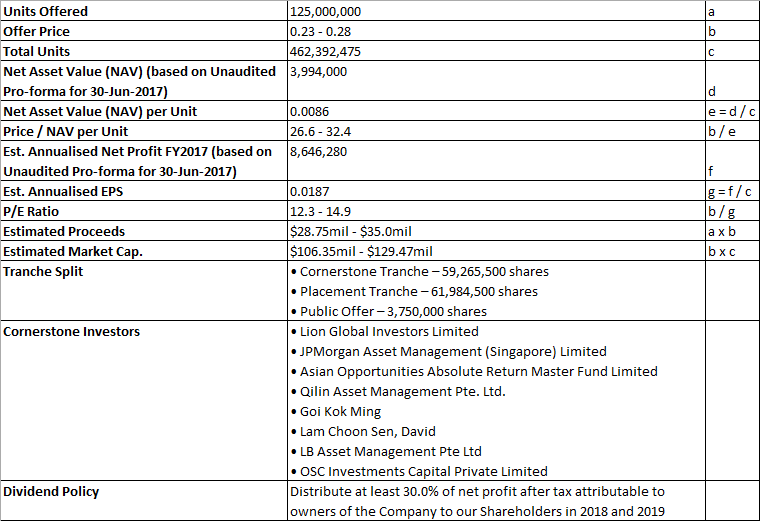 Among the significant cornerstone investors are Lion Global Investors Limited, JPMorgan Asset Management (Singapore) Limited, Mr. Goi Kok Ming and Mr. David Lam Choon Sen.
Mr. Goi is the Chief Operating Officer of GSH Corporation Limited which is a property developer listed on the Mainboard of the Singapore Stock Exchange. Mr Goi is also the son of the famed “Popiah King” – Goi Seng Hui who remains the executive chairman of the company. Mr. David Lam is the founder and Executive Chairman of Goodpack Ptd. Ltd which is a global logistics solutions provider. Based on these details, the structure seems remarkably similar to the Jumbo IPO where cornerstone and placements where snapped up leaving very little to the public. Along with the hype and a well-known F&B brand, the public offer was oversubscribed many times over. This resulted in a large retail interest which bid up the stock price of Jumbo. Based on this alone, we anticipate that No Signboard will likely generate a large retail interest among investors. With such a small public offer, there will be a huge pent-up demand of the shares during the listing and shareholders from the placement tranche are likely to take the opportunity to flip the stock. Based on the profit and loss statement, it would seem that the revenue has been fairly flat if not declining. Revenue grew from $24.8mil in 2014 to $25.25mil in 2015 only to fall to $22.74mil in 2016. On an annualized basis, the 2017 revenue is $22.3mil which is a further decline from 2016. Our first impressions of No Signboard isn’t great. Its expenses from year to year seems fairly consistent and comparable. It sounds like this is a one-time income which will not be repeated in the future and should be factored in considered of future income. Taking a closer look at the breakdown of the revenue, we notice an alarming trend, the revenue for its restaurant core business has been declining since 2015. If the 9-month figure for 2017 is annualized, the revenue from restaurant sales is only $21mil, the lowest it has been since 2014. The total revenue was padded up by the beer sales. Based on these figures, it would be worrying to that its core business is declining especially when it constitutes 94.2% of its revenue. The nature of many of assets and liabilities above raises many questions which require more in-depth assessment. But certainly from the matters above, it didn’t have the same clean balance sheet that Jumbo did. 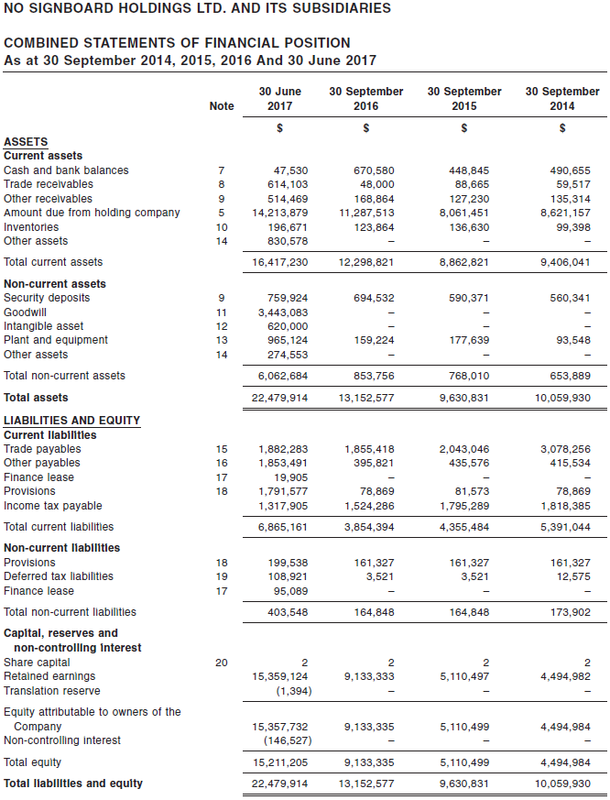 We try to answer selected questions on the balance sheet above. From a debt perspective, No Signboard has no debts on its balance sheet. The management has instead chosen to raise funds via equity rather than debts. Taking a closer look at Note 8, we see that there is slightly more than 31% of its trade receivables are past due but not impaired. These are between 61 to 90 days past due and are likely from the beer business as the prior years did not have any such long overdue trade receivables. The Preliminary Prospectus further states that the “average credit period on sale of food, beverages and live seafood is 15 days”. Therefore if credit is past due over 60 days, it does seem pretty significant. We are not sure if these have undergone impairment testing by the auditors. However, if some of these are indeed impaired in the future, it may hurt its profitability. 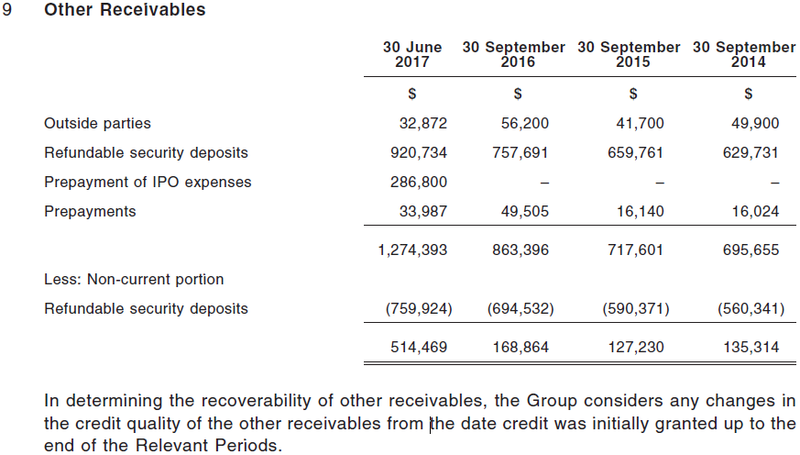 Looking quickly at Note 9, we notice a significant portion of the other receivables are refundable security deposits. We are understand from other parts of the document that these are deposits for the leases of restaurants and the office of our Beer Business. 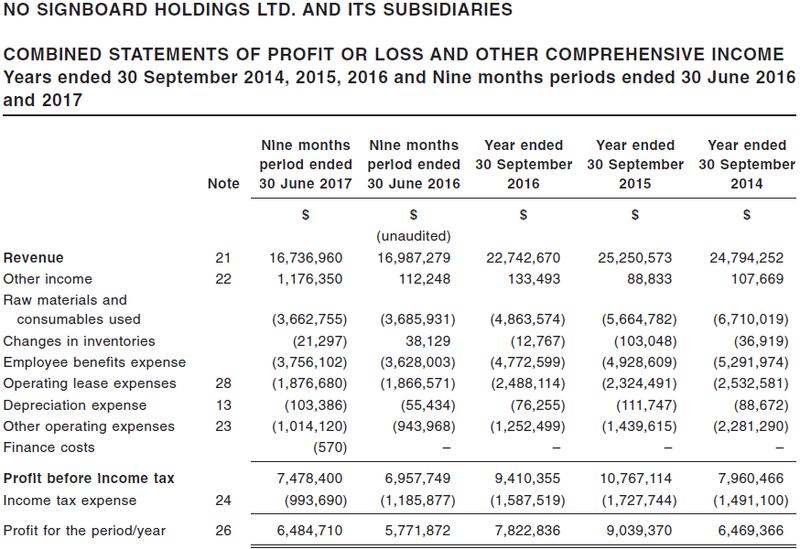 From Note 5 with regards to the amount due from holding company and Note 2(b), we are still not able to fully understand the nature of the amount due from the holding company. From Note 14 with regards to the amount of current and non-current “other assets” it seems that these are sponsorship provided by No Signboard to their distributors. Therefore it doesn’t seem like these “other assets” are physical and may be easily converted into cash. We may have to look at them from an intangible asset angle which may be illiquid. As its cash reserves are very slow, we can see why it would require this round of fund raising to expand. It would seem that its future expansion plans are for its beer business, ready to eat meals and establishment of new chain of casual dining restaurants. Therefore we think that No Signboard is likely to expand and grow its revenue through its non-core business rather than its flagship seafood restaurant. This differs from Jumbo’s fund raising strategy which a good portion of the funds was used to expand its core business. Therefore, the risk of expansion in new playing field is higher as it needs to establish brand loyalty and following for its new chain of casual dining restaurants, beer and ready to eat meals. Compared to Jumbo which already has an established brand and bring it to a wider customer base. Their business strategy that they are taking compared to Jumbo is also higher risk they are trying to expand by developing new businesses rather than expand their current core business. A particularly concerning point is also with regards to their declining revenue in their core business which should be the “cash cow” to fund expansion of other businesses. With a declining revenue and low cash position, it is no surprise to us that they need to raise funds for expansion. However, we cannot discount the possibility of high interest in this company due to its well recognised brand among retail investors. Many are likely to compare it to Jumbo’s stock performance after IPO and hope that this will be replicated as well. 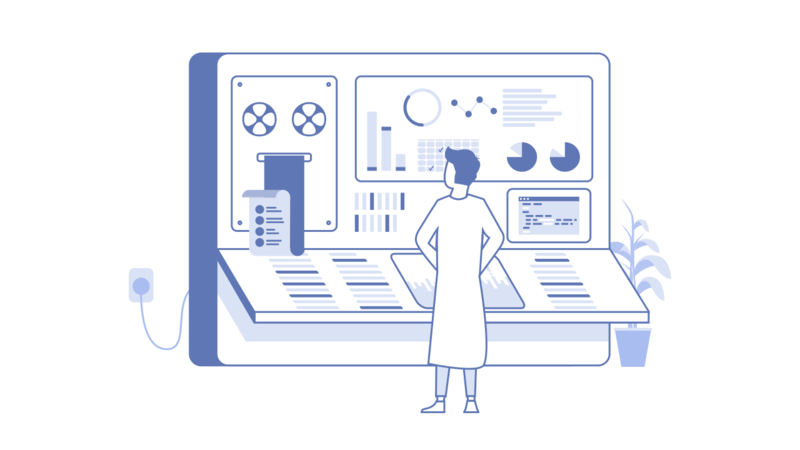 Therefore we anticipate that there will be high oversubscription on the retail investor’s side which will likely generate high interest at the point of listing as most will not be able to get any shares. After that, those who obtained their shares from the private placement are likely to flip their shares to these retail investors to fulfil the high demand and as a result bidding up the share prices. We might consider to try for the public offer and do the same and flip the stock back out within the first week of listing. However, we will not want to hold this stock in the long term as we are not able to ascertain their long term fundamentals. The views and opinions expressed herein are those of Tam Ging Wien (“the author”) and do not necessarily reflect the official policy, position or view of the author’s employer, organization, committee or other group(s) or individual(s). 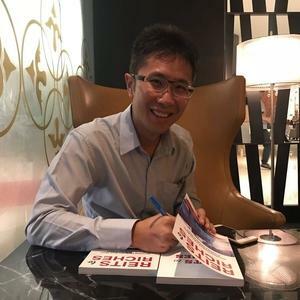 The author intend to subscribe to the Singapore Public Offer of No Signboard Holdings Ltd.